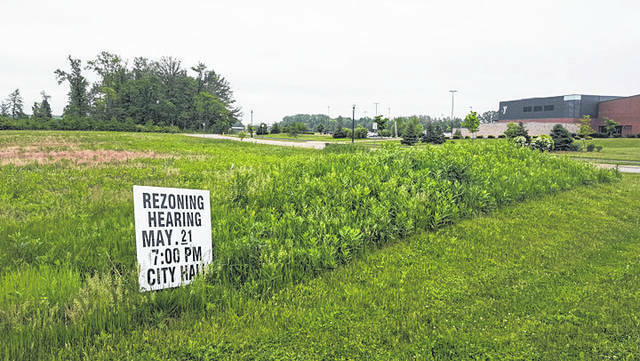 Delaware City Council on Monday approved an amended ordinance allowing for the development of Flats on Houk, which will be built on South Houk Road. Pictured is a portion of the land that will soon be developed, with the YMCA visible on the right. After two trips before the City of Delaware Planning Commission, a threatened lawsuit against a council member, and five readings at Delaware City Council, there is finally a resolution to developer Ron Sabatino’s ordinance asking for the reallocation of units on his property, named the “Flats on Houk,” located on South Houk Road. A special meeting of council was called on Monday due to Memorial Day falling in line with next week’s regularly scheduled meeting. After two hours of presentations, deliberation, and hesitation from both sides, council voted to amend Sabatino’s plan of building 180 apartment units on Area 3 (directly north of the YMCA). The amendment lowers the total number of units from 180 to 168 by eliminating parts of the buildings numbered seven and eight, which will sit on the northern edge of the development, closest to the neighboring community on the opposite side of Boulder Drive. Both the amendment to the ordinance and the ordinance as a whole were approved with a 6-1 vote. Councilman George Hellinger was the lone member to vote against the amendment and ordinance. The original development plan called for 140 units on Area 3, the development that sits on the northeast corner of South Houk Road and DiGenova Way. As part of his attempt to get the additional 40 units for Area 3, Sabatino proposed reducing the number of units on Area 4, which sits just southeast of Area 3, by 55 units. At the April 9 council meeting, the ordinance had been remanded back to planning commission where improvements were made to the buffering between the north side of the development and the houses north of the future development. No changes were made to the overall number of units and the issue of density, which had been among the chief concerns of residents from the beginning. As it wasn’t originally, the revised plan was not recommended for approval by planning commission. Sabatino would not budge, however, continuing to hammer home the idea that overall unit numbers shouldn’t matter to the neighboring residents because they wouldn’t be able to see them to begin with. “The difference between 180 (units) and some number smaller than that is invisible to anyone outside of the community in that we would ordinarily put our buildings on the building set-back line,” Sabatino told Jones. Vice Mayor Kent Shafer considered planning commission meeting with Sabatino yet again to discuss some sort of compromise, but Keller voiced her doubts about anything changing, given the results, or lack thereof, from the previous meeting. Mayor Carolyn Kay Riggle reminded the developer that discussions about overall density extend past the density of the development and included the number of people being added to the entire area in general. She then asked Sabatino if he would like for the ordinance to go back to planning commission for further discussion. With Sabatino pressing for a decision, council voted to move into a short executive session, where the decision was made to include the amendment that decreased the overall unit number to 168 by eliminating the eastern half of building seven and four units on the northern part of building eight. Along with the improvements to the buffering between the development and the existing houses, Keller was pleased with the final outcome of what she admits has been an exhausting back-and-forth. “I think we ended with a much better project, with more buffering and lower density, and a project that was more reflective of the feedback and concerns I’d received,” she said.